Let's talk novenas, shall we? I'm going to join up with Melody today, to share my 5 Favorite Novenas. But first, a little primer on novenas for you. What a novena is: nine days of intentional prayer for a specific intention, usually asking a saint to pray with you and for you. What a novena isn't: a magical formula whereby which God or a saint grants your wish if you only follow the formula correctly. A novena is a powerful way to pray, but not because it will "get you what you want" - because it will lead you even deeper in your prayer life and help you to come to peace which what God wants. God's will for you is what will bring you the deepest peace and joy, but we tend to be so lost in the cares of this world that sometimes we can't see that! Praying a novena helps adjust us to adjust our vision. Novenas are also so beautiful because you don't pray them alone - typically a saint accompanies you in your prayer. We can't pray 24/7 (not even those in monasteries do that!) but the saints can. It gives me great peace to know that I have a saint-friend who is always praying for my intention. Novenas are especially powerful in times of discernment. It can be scary, overwhelming, and downright confusing to discern a vocation. Having a patron saint by your side (someone who experienced what you are experiencing!) can be incredibly helpful and comforting. 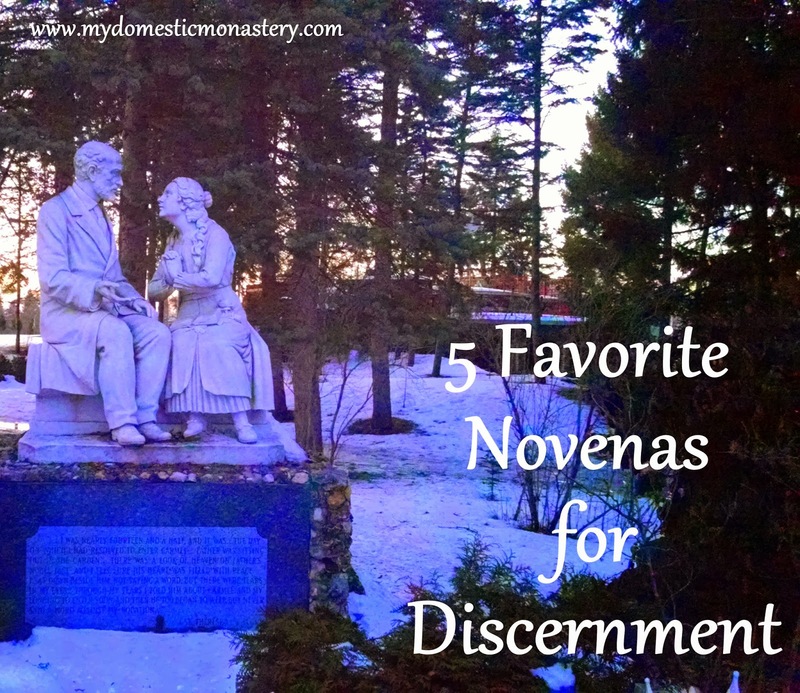 These are my 5 Favorite Novenas for discernment. This one is our go-to prayer for Andrew's academic/professional vocation. St. Joseph knew well what is was to provide for a family, and so we figure he has a special heart for that intention. I love having St. Joseph (a husband and father) praying for my husband, and I highly recommend developing a devotion to St. Joseph if you are a man or if you are praying for the man in your life. There are a number of variations on the St. Therese novena. You all know how partial I am to her but that isn't the only reason I recommend her as a friend during your time of discernment. St. Therese's path of discernment was a difficult one. She felt called to be a nun at a very young age, and a lot of people opposed that vocation, thinking she was too young to know what she was committing to. Of course, she did end up because a Carmelite at an extraordinarily young age, so she knows what it is to storm the gates of heaven when you are trying to say yes to your vocation. What an excellent friend for anyone facing opposition in a vocation! This is the novena our family prays when we are preparing for the baptism of a new child, but it's also perfect when discerning something. Of course, the Holy Spirit is God, not a saint, so this one is being said directly to the Holy Spirit. But the Holy Spirit is the one who strengthens and guides the Church (and her members!) and it is no coincidence that He is commonly referred to as "the Advocate." St. Jude is my standby for when I need to whip out the big guns. His novena is powerful because his prayer is powerful. St. Jude is the patron saint of hopeless causes, and he will storm heaven for your intentions! In the course of discernment, most of us reach a point where we feel a bit lost or we face a significant roadblock. St. Jude sweeps in to pray for us in a heartbeat! I'm listing this novena because Our Lady of Mount Carmel is our family's favorite title for Mary, but really any Marian novena will do. Mary was young, unmarried, uneducated, and poor when she said yes to her vocation. She understands how scary it can be to give God your "yes" - but she also knows that we can truly trust and believe in God's goodness. She is our Mother in heaven, and desperately wants to pray for her children and their needs. I love Novenas: I find them a great addition to my usual prayer life!